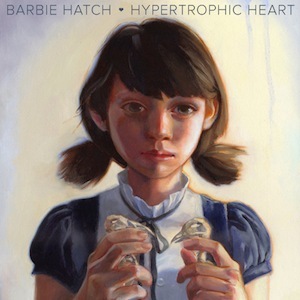 Hypertrophic Heart is the debut solo release from Barbie Hatch. She’s been popping up as a guest vocalist for hip hop groups like Canada’s Swollen Members and L.A.’s N.A.S.A since 2006. Hatch earned considerable attention via the N.A.S.A. track “Way Down,” on which she appeared alongside RZA in 2009. The album is a collection of seven short, sweet, straightforward electronic pop songs. Listening to Hypertrophic Heart, I found myself searching for an element to make it more substantial. Maybe all those years of augmenting the work of others have stunted her artistic growth. The result is a series of predictable tracks about stars, moons, etc. I was enticed by the promise of a Bee Gee’s cover, but her rendition of “Run To Me” lacked innovation and ultimately left me yearning for the original. In an age when countless fresh musical acts are born everyday, it’s hard to pinpoint anything on this album that makes it stand out. I imagine it would serve well as a dressing room soundtrack at an H&M. The girl is talented, no doubt. Unfortunately, however, Hypertrophic Heart falls just short of memorable.